Another article that’s a little later than I usually do, but long weekends and a day job means I need to sleep. So if you listened to Pod Is War, then you’d know my general disdain for the build to WrestleMania 34 and lack of faith in this one being positively memorable. Now the next logical step is for me to say, LET’S FIND OUT! But wait, wait, let’s summarize NXT Takeover NOLA, since that was generally received well. So there we go, it was a damn good Takeover, not the best ever, but damn good. Now, we can get to the point of getting to WrestleMania 34. It’s a battle royal for a trophy that hasn’t matter since it became a thing. I mean, what’s to describe. Midcarders and jobbers got eliminated, then it comes down to Matt Hardy, Mojo and Corbin. Wyatt appears and helps Hardy eliminate the other two, they embrace, pose in the middle of the ring, and that’s that. The EXPEDITION for Gold, is off to a WONDERFUL start. The stalwart of the Pre-Show, Cruiserweight matches! Now all of us who watched the 205 Live tournament, have noticed that the in-ring work has gone up. However, the characters are still cookie cutter and not focused upon, so the stories aren’t tangible. That being said, this match was a good match, but nothing surprising, except for Cedric nearly losing his balance and dying twice. Not the best match of the tournament, and being the second match on the Pre-Show, it wasn’t even supported by a decent crowd. Cedric wins, and now hopefully they can learn how to balance characters to appeal to casual fans, while keeping decent work rate. Same as the men’s, literally no one cared. It seemed like the crowd eventually work up when Sasha and Bayley had their moment, but then Naomi apparently not getting eliminated and then sliding in at the end, killed things. The crowd popped hard for Bayley and then we got swerved. This was the beginning of a common theme in Mania this year. This match opened the main show, and it was what everyone expected. We had a lot of action, Miz showed a lot of guts by telling the Miztourage to go to the back and fight his own fight. Miz really was the star of this match, he had a lot of old school heel moments and scouted both men well, resulting in countering an Enzugiri by Finn Balor, into a Dragon Screw over the top rope. Seth and Finn had the big flashy spots, break ups, springboards and Seth even pulled off a double Blackout (since we don’t call it the other thing). Thanks to the afore mentioned spot, Seth was in perfect position to hit one more Blackout on The Miz, and pick up the pinfall victory. So Seth is now a Grand Slam Champion, the last on The Shield to get it, but hey they’re handing those out like free water ice on the first day of Spring. So I guess we’re supposed to care, right? Well it’s the prestige of the Flair name versus the mystique of the streak. In a hard hitting match, that had a lot of back and forth, it did mostly live up to the hype. Charlotte is spotty with her match quality, and Asuka occasionally just out ranks the opponent too much, so the dynamic looks awkward. This was even, and the Figure 8 is still a legitimate finishing maneuver. Our owner Greg Demarco went lone wolf on the Charlotte train, and good on him. I didn’t want them to break the streak yet, but there really isn’t another woman who could reasonably do it. This match had a long build since Jinder had wins over Roode and Orton, but Rusev getting added was random. We saw a match that was, well odd. There was a lot of pairing off, not a lot of team work, and then a finisher spamming party. So Jinder was the last one to hit a finisher, so he picks up the win over Rusev. So we have a NEW America hating foreign heel, US Champ (somewhere Greg Demarco rejoices). A little surprised that Rusev didn’t get the win, purely, to placate the crowd. But Jinder will be a good champion, even if it’s possibly short lived. This match had most people’s curiosity since Ronda wasn’t really impressive these past few weeks. Kurt and Trips started things off, with Kurt looking better than Survivor Series, but still very slow and old. This was all just leading up to Ronda getting the hot tag, and wow, she came out like a house on fire. Ronda started off too hyped, but fell into rhythm nicely. This was her coming out party and she was amazing. Throwing hands with Triple H, breaking up a pin attempt and getting across the point that she’ll use a cross armbreaker as her finish. Easily the most entertaining match, maybe it wasn’t technically amazing, but it was fun, exciting and the high point of the show. The Usos finally get on the main card, but can they stop the sledgehammer wielding behemoths? This match began the downward spiral of disappointing matches. If we were still in the PPV age, I would’ve said this one had time cut from it. Weird spots, Luke Harper chillin on the turnbuckle for a few minutes to unveil a new Super Powerbomb finish. And in less than 7 minutes, we have new champions, who dispatched of the two top teams from 2017. Elias came out as a distraction for Cena making it seem like it wouldn’t happen. Then when Cena was about to leave, the lights go out, the hat and coat appear and then disappear in the middle of the ring…and the gong hits. This match was supposed to showcase Undertaker’s new hip. His hair was the correct length, he pulled off and Old School, a leg drop, sat up mid 5 Knuckle Shuffle for a fun gif and wins after 1 Tombstone. I guess this match was the physical embodiment of “be careful what you wish for”, since Cena got squashed. I have no Earthly clue what this match was to be fair. Daniel was picked off early by the heels before the bell, so he languished on the outside for 10 minutes while a sick, freshly off of surgery, not even wrestler, took out 2 main event players. Yes it can be argued that Zayn hasn’t really reached that height, but we’ve got a nearly 50 year old man taking on two full time wrestlers. Then, Bryan makes a big save and it’s Shane’s turn to play dead for a while. Cheap pops,and Daniel getting his stuff in was academic, but Daniel and Shane win, so now we’re gonna have weeks of Owens and Zayn pulling a Heath Slater. Now most fans should’ve tempered their expectations, but of course they didn’t. So welcome to another match that failed to really deliver. The match was good from a technical and story telling standpoint since you knew something was wrong with Shinsuke, since he wasn’t his usual playful self. But in a match that was paced too slowly, never really grabbed an already tired crowd’s attention, this really suffered. AJ Styles winning is perfectly fine, even though many wanted to see Shinsuke win. The only saving grace to all of this, is we got a well executed Nakamura heel turn. Anyone who liked Shinsuke in New Japan knows he began as a badass heel, and CHAOS was actually a heel stable before Nakamura went more eccentric. This match, was…what we expected it to be. Alexa ran around, tried to take some short cuts, failed and Nia killed her and did some damage to Mickie James as well. Hooray, Nia wins, in probably the only ‘being bullied’ angle that absolutely no one cared about. Braun literally walks through the crowd and chooses a child. I had flashbacks to the Power Rangers Turbo movie…and that was crap too. Braun has single-handedly ruined the legitimacy of every current tag team. He beats The Bar by himself, the kid is technically the youngest champion in WWE history (sorry Rene Dupree). So yes, I personally hated this, it took too long to find the kid and this is just a slap in the face to the story telling that it’s supposed to be even a little realistic. I’m gonna need to find Cornette’s reaction. This match was really the only one they put effort into over the last few weeks. They also had a solid match at WrestleMania 31, so things were looking up. Oh ya, but swerves and underwhelming is the name of this show. What was this match? 10 Suplexes, no real tension, no real intrigue, Roman just kicks out of 5 F5s or something like that. This was what you decided to close a bloated 7 hour event with? I mean seriously, Goldberg vs Lesnar from ‘Mania 20 was a better match. 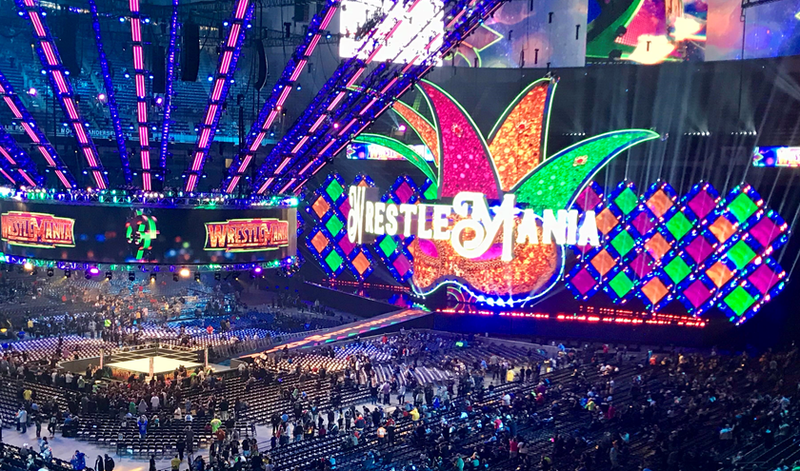 WrestleMania 34, the show that peaked halfway through and ended so poorly that any of the good is immediately forgotten because of how bad, the bad truly was. Advantageously I became Trivia Champion at the Annual WrestleMania Party I go to. It came down to a last minute answer to force a Triple Threat lightning round. Triple Threat lightning rounds are stressful, let me tell you. Truly inspired by The Viking Exprience, Steve Cook takes a look back at the Worst Tag Team Names in his latest Top 5! The Superstar Shakeup brought some new faces to Monday Night Raw & SmackDown Live. In what was considered a bit of a surprise as they’re currently NXT Tag Team Champions, Hanson & Rowe made their debut on Raw. Only they weren’t Hanson & Rowe, they were Ivar & Erik. They also weren’t the War Raiders. Instead, they were The Viking Experience. A week later they’ve changed to the Viking Raiders, which is slightly less horrible but brings back memories of the NFL during World War II when we had the Phil-Pitt Steagles. The only solace fans can take is that Ivar & Erik won’t be sunk on the main roster because they’re known as the Viking Experience or the Viking Raiders or whatever else. They’ll be sunk on the main roster because they’re a tag team. And hey, it’s not like they’re the only tag team ever to have a crappy name. Here’s five others! Don’t get me wrong, I loved the dynamic between Bryan & Kane. If there are two wrestlers I would like to see/hear do a talk show, it would be the newly Trumpian Glen Jacobs & The New Daniel Bryan. They have amazing chemistry as a unit, though they couldn’t be further apart as wrestlers or on the political spectrum. The name though…the WWE Universe screwed this one up. Team Friendship was right there for the taking. It would have been the perfect name for Kane & Bryan based on the counseling they had gone through with Dr. Shelby. It was one of those names that would have been stupid and awesome at the same time. Instead, they went with the lazy mish-mash. Which made even less sense when they reunited years later with Bryan firmly in Yes Mode. I am kinder to mish-mash names than most. I see a lot of hate out there for names like Jeri-Show, Jeri-Miz, Rated-RKO, Rybaxel and other names that wrestling writers obsessed with Brangelina gave tag teams. For me, the best part of Ryback & Curtis Axel as a tag team was their name. A team that came along before Brangelina was a much worse example of this fad than anybody that came along after. Kronus was part of the Eliminators, and his partner Perry Saturn decided to get some work with WCW. New Jack was part of the Gangstas. I don’t know what happened to his partner Mustafa, but nobody else seemed to care. So New Jack & Kronus decided to team based off of mutual respect. Nothing wrong with that. The name was terrible though. If they had plans for this duo, they really should have come up with something new, instead of something that reminded us of two tag teams that we liked more. Elisa looks great in her Chairshot gear. Miller & Thorne were known as The Mighty Don’t Kneel, or TMDK for short, during their run throughout Australia, Japan & the American independent scene. WWE likes to change these things up, for obvious reason. So Shane Thorne got to keep his name, but Mikey Nicholls became Nick Miller, which gives us the TM part. 61 is the dialing code for Australia. So it’s kind of clever. Here’s the hitch in the getty-up: No good tag team name needs this much of an explanation. You see Ax & Smash, and you understand why they’re called Demolition. Bret Hart & Jim Neidhart walk out accompanied by Jimmy Hart, and The Hart Foundation sounds apt. Heck, Honky Tonk Man comes down with black-haired Greg Valentine and you get Rhythm & Blues right away. This thing…well, there’s a reason they changed it to The Mighty once they turned heel. New anything is bad news. Especially in pro wrestling, with the exception of the original New World Order. Remember the New Blackjacks? The New Rockers? The New Midnight Express? If you’re my age, you’re probably trying to forget these teams, as they were nothing but a pale imitation of the original teams. The New Blackjacks were Blackjack Bradshaw & Blackjack Windham. Marty Jannetty brought along his buddy Leif Cassidy to form the New Rockers. The New Midnight Express were Bodacious Bob & Bombastic Bart. I might be mixing those up, but I don’t care enough to look it up. It was that bad. I’m pretty sure Ricky Morton & Robert Gibson have never retired because they’re afraid somebody will try to make a New Rock N Roll Express. People are learning, though. When Konnan put Santana & Ortiz together as a new tag team for him to manage in Impact Wrestling, he was smart enough not to call them The New LAX. They got to be LAX while Homicide & Hernandez had to be The OGz during their feud. This may require some explanation. Matt Sydal was a young up & comer in the Midwest indies back in 2005. The boy had all the high-flying moves you could ask for, and a look that any babyface would love to have. He was ready to take ROH by storm, but he needed a partner! It seemed like it would be Joey Matthews for a minute, but Matthews had other business at hand with Johnny Nitro & Melina. Hardly an opportunity a wrestler would turn down. So Fast Eddie got the nod, as he’d had some ROH appearances in the past. The ROH message board got the opportunity to vote on a name for Matt & Eddie, and I can’t tell you what the other options were, but I can tell you what won. The Air Devils. See, daredevils, air devils, haw haw. A name so bad that the ROH commentators crapped on it during their debut match in Dayton, Ohio, which happened to be the very first ROH show I saw live. It was the Air Devils’ first & last match together, as Fast Eddie turned on Matt Sydal and joined Prince Nana’s Embassy. Just a terrible piece of business, though it worked out in the long run for Sydal. He got over with ROH fans and had a pretty good run there. Fast Eddie…well, I’d be lying if I said I remembered a thing he did with the Embassy. When that faction won a Trios Tournament at another Dayton show I attended, they were represented by Alex Shelley, Jimmy Rave & Abyss. No Fast Eddie. He never saw his dismissal coming. Did anybody else notice that fans chose two of these names? It goes to show that even if “The Viking Experience” is a terrible name, there’s no guarantee that we would have done better. The world of Lucha Libre can be insane and overwhelming–but you have Joe Dinan here to help you make sense of it all! I did not watch either of these shows, truth be told on weeks that I’m too busy I’ll probably skip Tuesday at least. Not that I plan on always skipping them but sometimes duty calls in life and Friday is really the only televised show CMLL cares about. CMLL current has what I call WWE syndrome, in the sense that they have a comfortable business right now. They were struggling a little last year until LA Park and the Lucha Brothers came in for a summer tour basically. Cibernetico, El Zorro, and Charley Manson coming in helped to an extent too but not the same. So ever since then CMLL has enjoyed very nice attendance so they don’t feel the need to put in a desperate effort. Which is what happens sometimes. Wrestling companies all go through that period once in a while so I’m sure they’ll eventually be back to high quality things. But right now it’s AAA giving high quality. So on the Monday Puebla show they set up a Police Man vs King Jaguar hair vs hair match which will be this Monday. I can’t imagine most are interested but these guys probably wanna do something. And nothing of significance happened on Tuesday. Nothing usually ever does. Volador and Ultimo Guerrero successfully won Block B and will face Titan and Cavernario next week. Or this week. Depends when this drops. It will be a good match. Block B was definitely a step down from Block A as far as quality wrestling goes. There was a lot of brawling and similar finishes here in Block B. That’s really all that’s going on. So some of this AAA news involves MLW and Impact so I’m going to put it all here because there’s no point of typing it twice. AAA has two shows this week, one on 4/26 and 4/28. I won’t be watching the one on 4/26 live because Avengers Endgame is calling. But the line ups look like this for 4/26, Psycho Clown, La Parka, and Puma King vs Rey Escorpion, Texano jr, and Chessman. Laredo Kid and Brian Cage vs Taurus and Daga. Poder de Norte vs Sammy Guevara, Jack Evans, and Australian Suicide. 4 way match with Golden Magic vs Hijo Del Vikingo vs Villano III Jr vs Flamita. Taya and Faby Apache vs Chik Tormenta and Luchadora surprise. Lady Maravilla and Black Danger vs Big Mami and Nino Hamburguesa. For the 4/28 show it looks like, Psycho Clown, Laredo Kid, and Puma King v Rey Escorpion, Texano Jr, and Taurus. La Parka, Golden Magic, and Nino Hamburguesa vs Chessman, Averno, and Dave the Clown. Hijo Del Vikingo, Flamita, and Villano III Jr vs Poder de Norte. Sammy Guevara vs Jack Evans vs Australian Suicide. Faby Apache and La Hiedra vs Lady Maravilla and Chik Tormenta. So AAA also has shows coming up on May 3rd and May 5th, Cinco de Mayo. But they also have some joint show which I’m not sure if it’s going to be on just TV Azteca or on Twitch too. There’s no way of knowing until the day approaches cause it’s AAA but it’s some tournament gimmick between 5 “companies”. I use quotes because Konnan is quite literally on creative for all the companies. One company isn’t technically even a company anymore. Lucha Libre Elite is a defunct company propped up by AAA to do invasion angles. The other is Aro Lucha which isn’t even like, it’s own company. The Harris brothers run it with Konnan and they basically use AAA talent and Mexican independent talent. So it’s again, basically AAA. Then we have AAA proper, whatever that entails. Then we have Impact and MLW. So at least in theory those two will use their own talent. It’s some tournament format supposed to happen on May 2nd. I’ll see if I have more information next week before it all happens. Maybe Konnan will reveal more on Keeping it 100 this week.